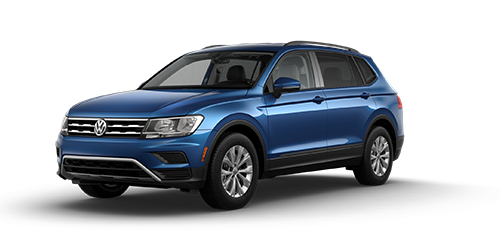 Joe Machens Volkswagen is excited to introduce Jefferson City and Sedalia, Missouri area drivers to the new 2019 Volkswagen Tiguan. This new compact SUV boasts a versatile 3rd row, remote power liftgate, and an adaptive front-lighting system. The headlights turn ahead of Tiguan to illuminate the path ahead. You'll turn more than just heads in this new Volkswagen for sale. If you care about having interior room, you'll find it here. The 2019 Tiguan provides ample legroom for all occupants. An available panoramic sunroof accents the sleek cabin. Each row of seating is illuminated and receives a breath of fresh air. When you want the appearance of leather seats with none of the drawbacks, the V-Tex leatherette seating is attractive, comfortable, and easy to maintain. Since you're shopping for a new SUV, cargo room is likely high on your list of desired features. Fold down the rear seats in this 5-seat SUV and have up to 73.5 cubic feet of cargo room. Box - checked. When you want an affordable SUV loaded with technology, take these directions to Joe Machens Volkswagen in Columbia, MO. When you arrive, you'll receive a guided tour of the standard features and systems then head out on an enjoyable test drive. For 2019, the new Tiguan arrives in ten trim models to help you choose the ideal new car for your garage. The base model Tiguan S offers features such as VW Car-Net® App-Connect and a 6.5-inch touchscreen. Move into the Tiguan SE for Blind Spot Monitor & Front Assist. Looking for VW Digital Cockpit? The Tiguan SEL delivers the technologies you care about. Climb into the cockpit of the SEL Premium R-Line with 4MOTION® to have 4MOTION® all-wheel drive. We are proud to be your full-service VW dealer. Drivers from Sedalia and Jefferson City are invited to visit our dealership for affordable car loans. We hope to see you soon at Joe Machens Volkswagen.